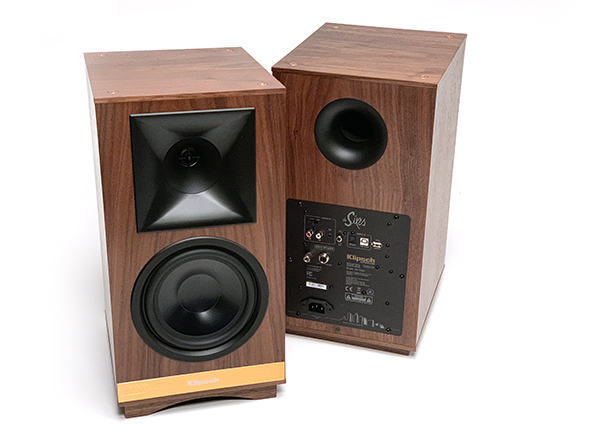 With 40 years of production under their belt, Klipsch has a long legacy of building high-qualityspeakers. 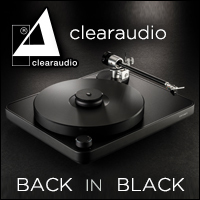 While most fans of the company’s offerings are familiar with Klipsch’s classic passive designs, their aptly-named “Heritage” series ups the ante with built-in amplifiers. Here we review their largest Heritage offering, “The Sixes” powered speakers which offer a musical experience transcending their price point. First off, potential owners should know The Sixes are much more than powered monitors: they are moreof a one-stop audio solution. 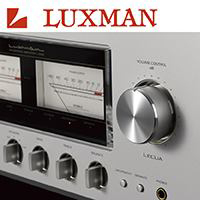 A built-in DAC with 192kHz/24-bit resolutionoffers a multitude of digital connection options including optical (Toslink), coaxial, USB, or Bluetooth. 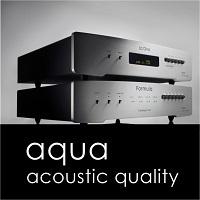 The speakers accept line-level inputs too. A single pair of RCA connectors and a stereo mini-jack give the speakers extra versatility for multiple external sources. The RCA inputs serve two purposes, dictated by the flick of a switch. One position assigns the RCAs as standard line-level inputs. 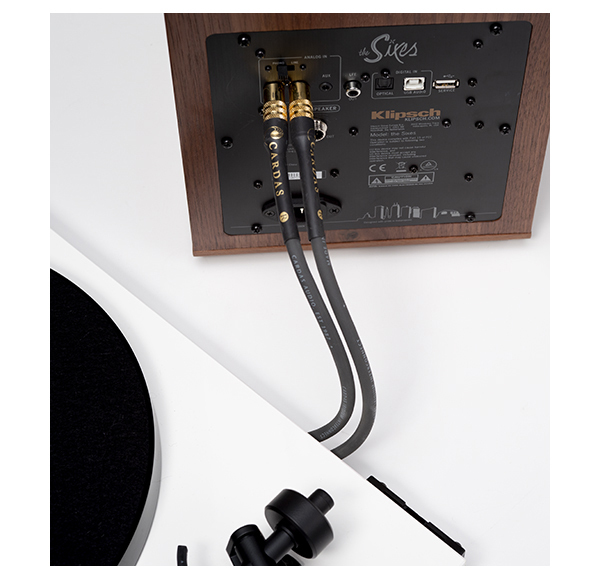 The other accommodates vinyl enthusiasts with a built-in phonostage for a turntable connection. With all these options, a Sixesowner can connect any source of their choosing, and in a few seconds, be ready to dance around the living room to their favorite tunes. 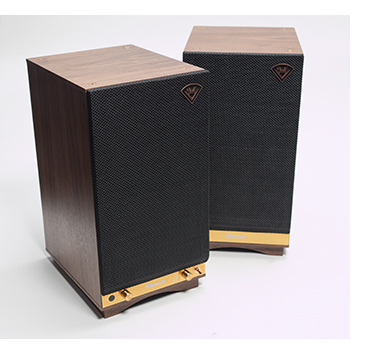 Like many powered speakers designs today, the Klipsch “pair” are not identical. 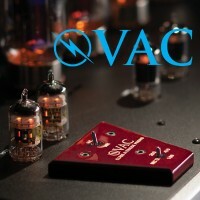 One speaker houses the amplifier, controls, and inputs. 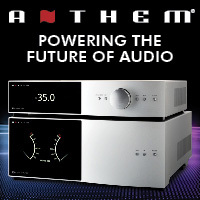 The other passive speaker connects to the first via a suppliedcable, then takes its direction from the brains and brawn of its sibling. Once connected, the built-in amp delivers a continuous 100 watts to each speaker, so there’s plenty of juice to share. Klipsch has pre-defined the passive speaker as the left channel, relegating the smarter twin in the right position. For listeners with power outlets on the left side of the room, this scenario may create a challenge. In that case, a lengthypower cord or some connectivity-creativity – like swapping inputs for the leftand right channels — is necessary. 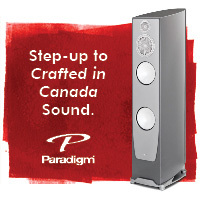 The bottom-front edge of the right speaker has a power on/off toggle switch, a volume knob, and an LED indicatornoting the input selection. A handy remote allows a listener to make changes from the comfort of their listening chair. While The Sixesfeature a traditional boxy shape, the retro-styling offers a nice aesthetic twist. Our test pair, featuring the Walnut veneer cabinets with complementing copper-color trim, make these speakers stand out visually. The company also offers an Ebony version for those seeking an alternate finish option. Physical dimensions are substantial at 8.625” (22cm) wide, 16.75” (42.55cm) tall, and 11” (27.9cm) deep. The left, passive speaker,weighs in at 16.00 lbs (7.26kg). Its right-side twin with the extra internals tips the scale at 17.74 lbs (8.05kg). 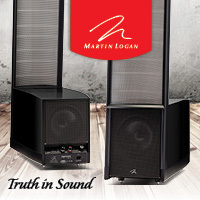 Although the speakers offer different functionality within, the drivers are identical. Klipsch chose one-inch (25.4mm) titanium tweeters on Tractrix horns, 6.5-inch (165.1mm)woofers, and a rear port for added bass reinforcement. 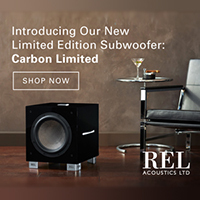 According to the company, the speakers offer a flat frequency response down to 40Hz, with expected roll-off below that. Those desiring deeper bass will appreciate The Sixes’ subwoofer output. As monitor designs, The Sixesrequire stands to elevate the tweeter to ear level. Unlike many bookshelf speakers which have a flat base, the Klipsches feature an extended lower edge surrounding the bottom. As a result, once the Klipsches take their seat atop the stands, the stand’s upper surface disappears, and the stand-speaker combination appears integrated. To prevent the speakers from scooting around on the stands if bumped, a couple ofdots of Blu-Tack putty offer just enough stickiness to keep everything aligned. Once allowed to sing, The Sixesunleash marvelous sonics. As one should expect from a company like Klipsch with a long history of wonderful speaker designs, the woofing and tweeting integrate seamlessly. 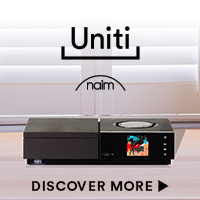 The carefully-chosen internal amp, preamp, and DAC within complement the drivers and cabinets perfectly for optimal sound. Sonically, The Sixesreside slightly to the warm side of neutral, making long listening sessions a pleasure. 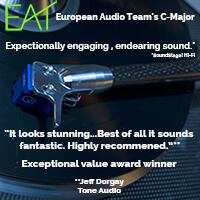 Rest assured, though, that the touch of euphony does not sacrifice the details which enhance the listening experience during favorite tracks. Klipsch’s deliberate speaker voicing offers a welcome, and easy-to-embrace balance. On well-recordedalbums like Elliott Smith’s Roman Candle,the vocal nuances and delicate guitar strums reveal themselves with naturalness. On older, “sonically-challenged” recordings, the Klipsches do a nice job of taking out the sharp, strident edges, leaving a much more palatable overall musical experience. 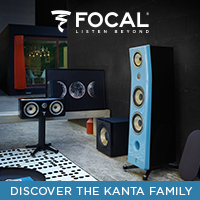 Once optimally placed, the speakers offer a wide and deep soundstage that exceeds their physical presence. Bass proves taught and authoritative. High frequencies like those revealed among the complex sound from cymbal rides render with a high degree of delicacy alongside the anticipated ring and decay. At their price point, The Sixesoffer a lot to love and little to criticize. 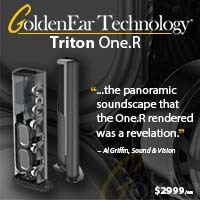 Yes, there are other speakers out there which enable greater refinement and resolution. However, those characteristics normallycome at a significantly higher cost. 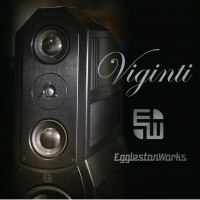 Those seeking the ultimate speakers should not expect perfection for under $1,000. That said, The Sixes– at a mere $799 — defy their entry-level price tag. For $799, The Sixes speakers offer an optimized phonostage, linestage, DAC, and amplifier. Rarely in audio does one get so much for so little. 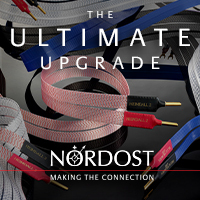 Heck, many audiophiles out there spend more than that on interconnects! Kudos to Klipsch for delivering a wonderful product that resides within the budget of most audio fans who prioritize music in their lives. 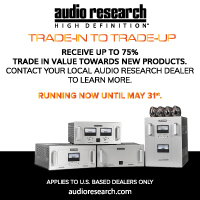 For purchases made on the Klipsch website, shipping is includedin the price tag. Also, a new owner has a 30-day money back guarantee in the unlikely eventthe speakers are not right for them. The only thing they have to lose is the cost of return shipping. If you seek a holistic audio system within a budget around $1,000, these Klipsches offer a stellar foundationand leave you $200 toward the source of your choosing. For their great sound and integrated functionality The Sixesoffer a prospective owner, they handily earn a TONEAudio’s 2018 Exceptional Value Award.